Homemade beef stock adds wonderful flavor to soups and stews! No, I still don’t have any water so I won’t be making any beef stock today! For most of you who do have water, it’s Saturday, and making stock is a great Saturday activity. It makes the house smell great and there’s time to coax every ounce of flavor from the ingredients by cooking the stock all day. If you’ve never made your own stock before, I’d like to tell you in one word why it’s worth the time: Flavor. There’s no comparison between soup or stew made with canned broth and one made with homemade beef or chicken stock. Homemade stock has a richness of flavor that takes the finished dish to a whole different level. Besides the incredible flavor, a side benefit is that you make the stock mostly with ingredients that would have been thrown away, so it’s almost free. I already posted about how to make chicken stock, and the process for beef stock is similar, but there’s one very important difference. Do you know what it is? Read on. I keep two large containers in the freezer, and whenever I get chicken or beef scraps I save them until I have enough to make stock. 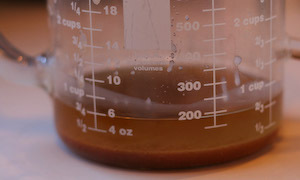 Here’s where the procedure for beef stock varies from chicken stock. It’s important to put the beef scraps on a cookie sheet and roast the meat for about an hour at high heat. This produces browning (the Maillard reaction) which produces flavor. For beef stock, roasting also releases fat. Emeril may rave on about pork fat, but while a little beef fat is good, too much ruins the taste of things. See all the fat on the cookie sheet? You don’t want that in your stock. I roasted about four pounds of beef scraps to make this batch of stock, and here’s how much fat was roasted out of the meat. The dark layer on the bottom of the fat separator can be poured out and added to the stock, but if there’s only this much I probably wouldn’t bother. 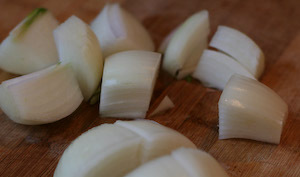 Besides roasted meat scraps (and bones if you have any) and water, the other three essential ingredients in beef stock are celery, carrots, and onions. 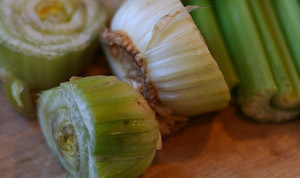 Use the celery ends and outside pieces you would otherwise throw away. This is a perfect use for carrots that are a little past their prime. 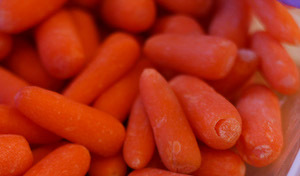 If you buy whole carrots, save the ends and peels for stock. Much as I might like to be a stock purist, I nearly always end up adding a little bit of beef base, preferably one that has meat as the first ingredient. I use about 1/4 cup of this in a huge pot of stock. If you don’t want to use it, just cook your stock a little longer so it cooks down more. This is how my stock looked when it had cooked about six hours and I was just about to remove the meat and vegetables and strain the stock. This tool, called a skimmer, is great for removing meat and vegetables while letting the flavorful stock run back into the pan. It also catches sediments and coagulated proteins. I have another one also with larger holes too. I strain my stock through a colander, then strain it through this yogurt strainer into a fat separator. As you can see, there’s not a lot of fat because most of it was removed by the roasting. After I strain the stock, I put it back in a clean pan and cook it down until it’s a deep brown color and has a lot of flavor. I just keep tasting it until it’s as strong as I want. This is how much beef stock I got from a bit pot of water in which I simmered 4 pounds of meat scraps and probably an equal amount of vegetables. These large containers hold three cups and the smaller ones hold two cups. I also have some smaller containers that hold exactly a cup. If you measure the capacity of your containers and then always use that size, you don’t have to thaw the stock and measure it to use when you make soup. 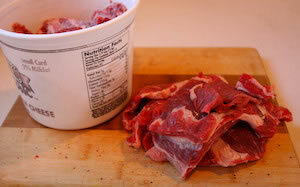 Save scraps of beef in the freezer until you have 3-4 pounds of scraps. Put beef scraps on cooking sheet and roast at 400 until meat is well browned and fat is cooked out. You can turn a few times, but it’s not essential. This may take close to an hour, depending on how big the pieces are. Fill large stock pot (12 quarts or bigger) half full of water. Add browned beef scraps, celery, carrots, and onions. Simmer on low for 3-4 hours, adding more water as needed so pan is always full. After a few hours taste and add some beef soup base if desired. After 6-8 hours, remove pieces of meat and vegetables and skim off sediment. Strain stock through colander. Then strain through cheesecloth, fine mesh strainer, or yogurt strainer. If you can, strain it into a fat separator to remove fat, or you can remove the fat by cooling the stock before you freeze it. 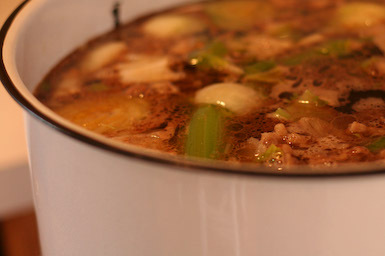 Put strained stock back into saucepan and simmer over medium high heat until reduced. I usually reduce it by about half, but taste to see when the flavor seems right to you. Pour reduced stock into freezer containers. Cool on counter top for about an hour. 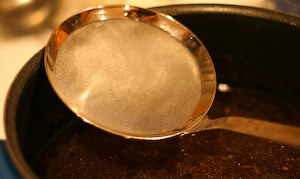 If you didn’t use a fat separator, cool in refrigerator overnight and remove fat in the morning before freezing. 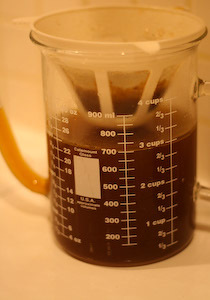 If you used a fat separator freeze stock as soon as it is slightly cool. I like to season the dish I am using it in, but you can certainly add anything you'd like. 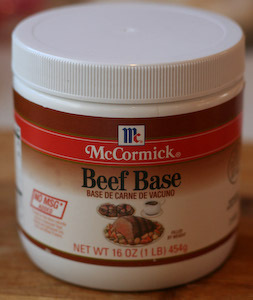 If you use the beef soup base, that definitely adds some salt. I make this with scraps I've saved, so I just throw the meat away. Most of the flavor has gone into the stock, but you could use it if you wanted. 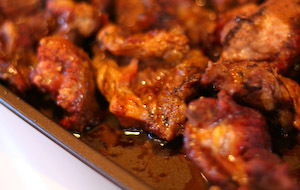 What do you do with the leftover meat? Do you toss it or use it? Sarah, I haven't made stock in the slow cooker, but I've been thinking of trying it! I did a search for beef stock recipe and yours came up. I'm so glad it did! Your instructions are thorough and easy to understand. I love the idea of saving the beef scraps in this way. Normally, when I am preparing to make stock, I have to go and buy the bones for doing so. Thanks for a great tip! You can definitely make the stock in a crock pot. I would roast the meat first, then put everything in a crockpot on high for 4-6 hours. Then strain the broth and taste, and you'll probably want to simmer on high for 30 minutes or so to reduce it. I'm wondering if it's possible after I bring it to a boil, could I put everything in a crock pot? My stove is propane and right now propane is very expensive to let the stove run that long. Thank Kalyn. I have to comment on this. This is the third time I have bought either a half a beef or a whole beef. This time we used the same farmer but a different packing house. They do things a bit differently than each other. Anyway, when I added that comment above, it was before I took the soup bones out of the freezer. The last packing house gave me bones that were mostly bones, almost no meat to speak of, I considered those dog bones. This time I opened the packages and was shocked at how much meat was on them! I have my stock simmering now. But I have to say I am so mad at myself. I told the packing house to only give me a few packages of the soup bones and get rid of the rest, because I thought they were going to be all bone like from the other place. Man, all that meat I just ditched! UGH. You live and learn! Amanda, beef bones with some meat on them will make wonderful stock. Just roast them same as the scraps. I’m curious, we just bought a side of beef and got beef soup bones with it. Can I use these instead of the beef scraps? How well will that work and what adjustments, if any, do I need to make? Trihardist, thank you! I love the flavor of this homemade stock. Eddie, just keep cooking and I guarantee, eventually you will not have too much water. In fact if I’m low on freezer space, I cook my stock down until it’s really concentrated and then add more water when I use it. 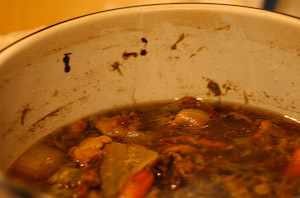 Hi sorry about the water probem, But I am makeing your beef stock and I think I put too much water in the pot. What schould I do ? Just cook it longer or dump out some of the stock. You’ve made it look so easy! I have a ton of beef bones in my freezer (I live on a cattle ranch) and I know what I’m planning for sunday 🙂 Mine don’t have near as much meat so I hope they work as well as yours. I’m glad your water is back on. Isn’t there something so elemental about making stocks? We make chicken and fish stocks regularly and of course when we poach meat, that’s stock for free! You’re right about the taste, incredible flavour are not the only words I’d use, genuine flavour that is the hallmark of a good cook. Sorry to say that there is still no water after my brother (owner of a sewer and drain company) and brother-in-law (contractor who remodeled my house) have spent the whole day here trying to thaw the pipe. They seem to think they have helped a little but the water is still not running. Thanks everyone for the nice comments about the stock instructions. CC, I forgot about bones, since I rarely have any. I just edited to add that. Good lord, no bones? Then where will you get that incomparable gelatine-y velvet from? Save your bones, too. I’ve been thinking about you and your water problem for days. I’ve been through that; a leak in the pipe, not a freeze. Man, that can mess you up. Good Luck! 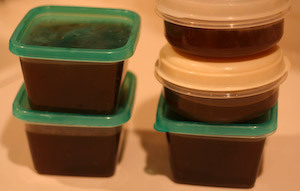 Kalyn, it’s true that there is nothing more satisfying than spending all day making a wonderful stock, and seeing those containers piled up in the freezer….except, maybe, having running water. I am sending my warmest wishes your way, in hopes they thaw your pipes! Sorry to hear, that you have no water! I have also made beef stock from scratch! The entry is in German, but the pics are perhaps interesting. I didn’t use beef base. I cleared the stock with minced meat and egg whites to get more flavour. So many methods to get the same. Thank for sharing. Sorry about your water trials! I’ve made chicken stock before, but never beef so this was quite enlightening as the method is different. Looks so good, and what a great way to use things which would often be tossed. OK, tonight there will be running water in that house. Has to happen. I’ve printed the beef stock out, that has to happen also!